Behind closed doors in its glossy spaceship-like headquarters, Apple is believed to be hard at work on a foldable smartphone that will bring an iPad-size screen to a device that remains small enough to use one-handed. Rivals Samsung and Huawei have already announced their first foray into foldable phones, dubbed Galaxy Fold and the Mate X, respectively. Apple has secured a number of patents that hint at flexible technology. However, the company is believed to be years away from launch, but that hasn't stopped industrious concept designers from mocking up potential iPhone designs. The latest slew of images come courtesy of graphic designer Antonio De Rosa. The high-resolution concept images reveal a very similar design to the Galaxy Fold, with an expansive, flexible OLED screen that opens like the pages of a paperback. A second edge-to-edge display appears on the front of the device. Just like the Galaxy Fold, this allows smartphone owners to use the device one-handed – without the need to unfurl the larger flexible every time you want to send a text message, answer a call, check directions or social media. Interestingly, designer Antonio De Rosa has included the square triple-camera design that is expected to appear on the next-generation iPhone, which is mooted to launch in September – provided that Apple sticks with its typical release schedule. The handset in the design, Apple iPhone X Fold, is very similar to a concept design of a second-generation Galaxy Fold, which eliminates the hefty bezels seen on the current model. 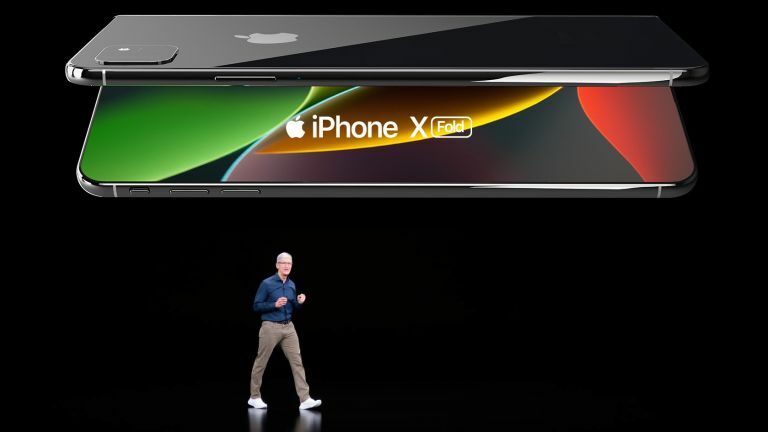 Likewise, the iPhone X Fold has an all-screen design on the front of the handset as well as the foldable screen inside the device. However, the most interesting aspect of the design is the packaging. Seriously. Apple is known for its slick product boxes. In fact, the company is said to employ a dedicated designer whose sole responsibility is to ensure the packaging provides a sensory experience when unboxing a new device. Designer Antonio De Rosa seems to have taken this onboard and created a slick new triangular box that can house the iPhone when it's folded at a right-angle. Huawei displayed its flexible Mate X with the same right-angle on its stand during the Mobile World Congress tradeshow last month. The Shenzhen-based company has not revealed the final packaging for the handset, so it could still adopt this design. Huawei Mate X will cost €2,299 (roughly £1,997) and will launch in summer 2019, although the exact date is not yet known. Meanwhile, the Samsung Galaxy will launch on April 26 in the United States and May 3 in the UK. It will cost €2,000, some £1,700 or $2,250 converted.